Almost 15 years of working at Walmart, most of it in the fabrics and crafts department, left me with a lot of sewing and craft supplies. Every time items were on clearance, my co-workers would tell me how crafty I am and suggest I could use them. So, I purchased way more than I will ever use. Now, I’m trying to use craft and sewing items I already have and focusing on thinking up ways to use more of all this “stuff”. 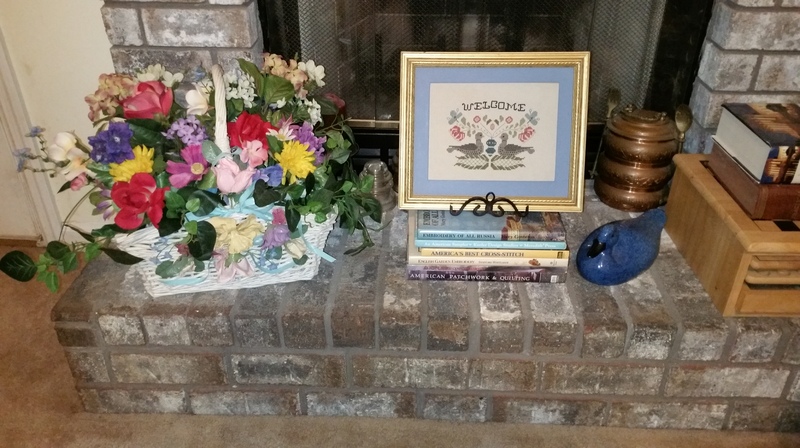 The photo above is the hearth on my fireplace. Last night I put together this basket of flowers using a basket my oldest sister decorated with silk flowers that were painted with some medium to make them look like porcelain. This was some craft thing decades ago. I have several bunches of Walmart clearance flowers, so I used wire cutters and cut them into stems and stuck them into styrofoam. Since I don’t know much about flower arranging, I just winged it.